This week I officially got my accreditation from the National Autistic Society’s Lorna Wing Centre to use the DISCO for diagnostic autism assessment. This feels like a big achievement – It has been intense!! 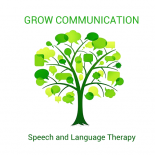 It has involved training at the Centre, led by Dr Judith Gould and others, practise of using the assessment in the Grow Communication Clinic and the writing of a case study which was supervised and assessed by the Lorna Wing team. I’ve been involved in autism diagnostic assessments to some degree or another for quite a number of years (I graduated as an SLT in 2003) and it is increasingly a part of my work with children and young people. I wanted to challenge and develop my knowledge about, and understanding of, autism and take it to the next level. So what is a DISCO anyway? As a parent the part of the DISCO you will experience is being asked lots and lots of questions about everything and anything related to your child/young person’s development. Ideally it is done over two sittings (accompanied by tea and biscuits). You’ll see your clinician writing lots and lots of notes and also filling in boxes/scoring with what can seem like random numbers. The team at the Lorna Wing Centre talk about the “dimensional approach” to assessment, and the “triangulation” of a range of sources of information. The parent interview is a crucial part, but the experienced interviewer also uses their own observations, informal and formal assessment, discussion with other professionals and all information gathered in scoring the interview. It sits really nicely alongside other assessment such as the ADOS, and this is how the Grow Communication team aim to use it, as part of a thorough multi-clinician process. The interview itself drills down deep into so many aspects of both early development and current life. It is a lengthy process – there is no getting away from that – but in my case study I felt that the depth of information created such a clear picture of the young person I was assessing. There was a real sense of a coherent picture forming, and a depth of understanding that I feel will be so valuable as I go on to advise the family and school about support strategies. It felt like a portrait created over many sittings rather than a snapshot. My case study ended up with a super-long and very descriptive report. I like to write a report that creates a clear pen-picture. An assessment is such an important process, and the report is the coming together of so much information. For me, it is important to be really clear about my working out, and to evidence the clinical judgement that I am making. In my experience the assessment is a key part of sense-making, both for the parent and for the young person. For the parent the lengthy interview (up to 4 hours) feels like an important shared narrative process, unpacking their family story in a safe place. I see a report not just as a clinical way to feed back. I am very aware that one day our children will be adults who may question and ask how they ended up with a diagnosis of autism. I would like to think that in ten or fifteen years the young person could pick up the report, see an affirming and positive picture of themselves and, if they chose and are able to read it, say “ah… that makes sense”. We gather so much information in an assessment and parents often feel they have to tell and retell this each time they meet new professionals, which can be exhausting and even traumatic. I see it is a mark of respect to capture all this information in a way that means it doesn’t have to be told over and over. It may seem a bit much but, like my old maths teacher told me, “show your working out so I know how you got to your answer“. I feel this makes it a truly transparent process. The final part of the course looked at the option to explore the categorising capabilities of the DISCO. The Lorna Wing team have put together a series of algorithms that enable you to match your gathered data against the various diagnostic criteria. That’s what all those seemingly random numbers are for. This really helped me to dig down into my clinical decision-making and look in a balanced way at the whole picture, taking account of all the variables. The algorithms help ensure it is an objective and robust process (robust is one of my favourite words as anyone who works with me knows!!!). This is just a brief summary, and some of my initial thoughts as I recover from the intensive course. It’s not a perfect tool as there never will be a perfect one, but I think this will be a useful tool in my toolkit. Image credit: Bruno Girin on Flickr. Licensed under Creative Commons. image unchanged. This entry was posted on July 16, 2017 by judephilip in Uncategorized.